So now we are waving goodbye to another awful summer, creeping into autumn and looking forward to cold feet and not being able to afford to put our heating on this winter. 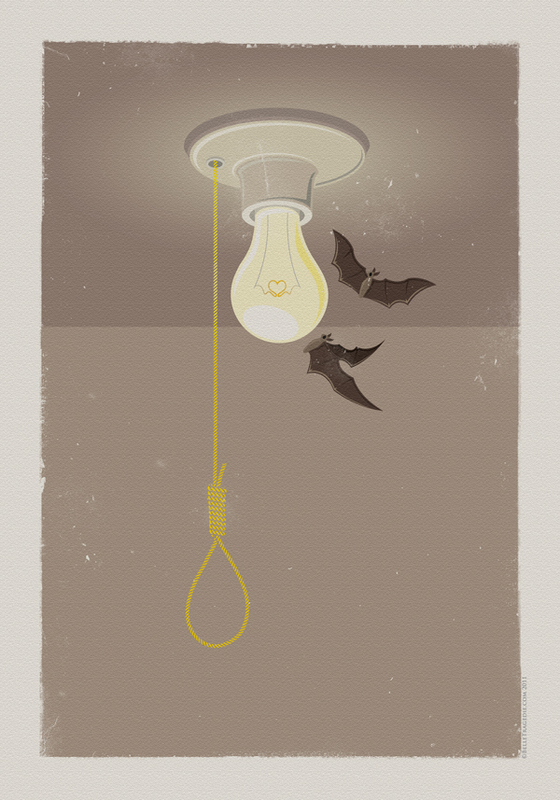 So with all this optimism, I have produced this lovely illustration inspired by The Smiths song ‘There Is A Light That Never Goes Out’. I’m sure the song conveys different emotions to different people, also depending on moments in life. From one point of view it can be taken as a song about a person with a great love for someone but unable to approach them about it. Another view maybe the feeling of an outcast and a sense of not belonging. Or it could be a combination of both, where a lonely person is clinging on with the idea of love being their belonging. I’m not sure what it means exactly, and not completely sure what I was hinting at with this illustration. But happy, sad, depressing, or positive – either way its a fantastic song overflowing with emotive ideas, and just like most of The Smiths and Morrissey’s songs I find it so inspiring.